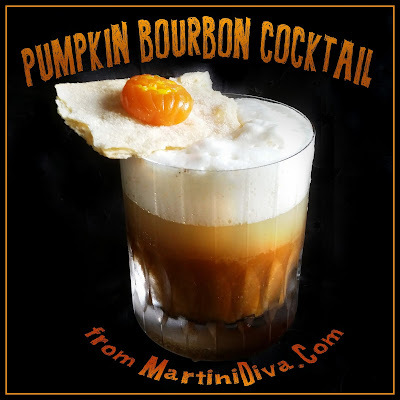 It's that time of year again, pumpkin is popping up all around us and I have yet to do a pumpkin cocktail with bourbon! Bourbon is such a perfect fall spirit that I can't think why I haven't already combined it with the quintessential fall flavor of pumpkin. I'm correcting that omission right now. I couldn't resist creating a cocktail foam for this one. It's kind of like topping your pumpkin cocktail with a pumpkin cocktail meringue. Just a touch of that maple bourbon was perfect accent in this cocktail, it really blended nicely with my Homemade Pumpkin Pie Syrup. I also couldn't resist using Wild Turkey, because, you know, turkey and fall go together and the 101 brought some lovely vanilla notes to this drink. BUT be warned, that 101 stands for the proof, this cocktail packs a punch! DIRECTIONS: Chill your glass. Make your Maple Bourbon Foam and set aside temporarily. Fill your cocktail shaker with ice then add your cocktail ingredients and shake until chilled. Strain into your chilled glass. Spoon on the Maple Bourbon Foam, lay the pie crust on top, place the pumpkin candy on the crust and serve. Add the ingredients for the foam to your blender and whip on high until the volume triples in size. Top off your cocktail! Perfect nip for a nippy night!